Champions League: Will Real Madrid retain title? Can PSG win? Are Barca flawed? 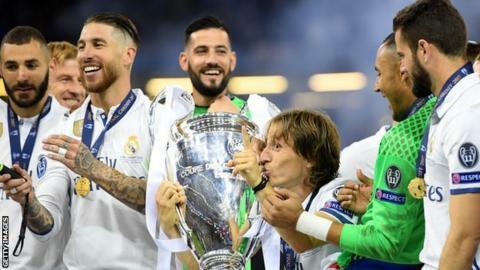 Real Madrid are chasing an unprecedented third consecutive Champions League title, Paris St-Germain are breaking spending records and Barcelona appear fallible. Add a record six British challengers into the mix and this season's competition, which gets under way on Tuesday, has all the ingredients to be one of the most intriguing yet. Can Real Madrid make it three in a row? After becoming the first club to win the trophy in consecutive years in the Champions League era (post-1992), Real Madrid have already made history. The real question is whether they can extend that repeat into a sustained period of dominance, following the achievements of their predecessors who won the first five editions of the European Cup after its foundation in 1956. There are positive signs in that direction. Rarely has a team gone into a Champions League season as such strong favourites. It's not just the superlative nature of El Real's second-half performance that swept aside Juventus in June's final in Cardiff that persuades, either. For the first time in a long time at the Bernabeu, it seems like there's a plan for the future beyond hoovering up superstars. The club has been astute in picking up young talent like Marco Asensio, Dani Ceballos and a host of others - and they have a coach in Zinedine Zidane who has the bravery to pick on merit rather than status. The success of Zidane's tenure so far can be measured not only in trophies, but by the fact that even Gareth Bale (and Zizou is a big fan of the Welshman) is not sure of a place, especially after Isco's rise to become arguably Los Merengues' star performer in the past six months. With Cristiano Ronaldo, Toni Kroos, Luka Modric and Sergio Ramos tied down to long contracts and Isco, Asensio and others set to follow suit, the future looks bright. Should we count Paris St-Germain among the favourites? If Real Madrid have stepped back from taking the transfer market by the scruff of the neck, then PSG have taken their place in some style. The signing of Neymar shook the football world, and it felt like a turning point for the French giants. For all their achievements since Qatar Sports Investments (QSI) took over the club in 2011, they had never been able to recruit an elite-level star in his prime - until now. With France's brightest talent Kylian Mbappe leaving Monaco for the Parc des Princes, Neymar will continue to be a part of Europe's most vaunted front three. It's just that this time it will be a completely new one, made up of the Brazilian, the teenage Mbappe and the profilic Edinson Cavani. There's little doubt the trio will click. Some have voiced concerns that Cavani will be marginalised, having been forced out wide when Zlatan Ibrahimovic was at the club, but both Neymar and Mbappe prefer to attack from wide areas. In fact, Mbappe said earlier this year that playing around a traditional number nine in Radamel Falcao gave him the freedom he needs. Cavani will do the same. Having missed out on Mbappe's Monaco team-mate Fabinho, PSG are perhaps short of a midfield destroyer, and neither Kevin Trapp nor Alphonse Areola really convince in goal. With last season's capitulation to Barcelona in the last 16 still fresh in the mind, it's PSG's mettle - rather than their flair - that will come under the microscope. Are Barcelona still realistic contenders? The sheer amazement value of Barcelona's comeback against PSG in that last-16 tie - largely inspired by the will and drive of Neymar, rather than the collective brilliance we've become used to in recent years - covered a multitude of shortcomings. Still in shock after the Brazilian's exit to France, the difficulties the Catalan giants face on the pitch and in the boardroom have been laid bare. Neymar should have been tied down but wasn't, and he had lost faith in the management. Lionel Messi has still not signed an extension to the contract that runs out in the summer, and after under-pressure president Josep Bartomeu claimed Andres Iniesta was set to sign a new deal, the legendary midfielder publicly denied it. Yet for all the chaotic management and fudging of transfers, the window wasn't as bad as it could have been. They've filled a few significant holes, with a quality new right-back in Nelson Semedo and the arrival in midfield of Paulinho, who has been as important for Brazil of late as he was disappointing for Tottenham. Ousmane Dembele, signed from Borussia Dortmund in Neymar's stead, is a generational talent and a potential Ballon d'Or winner. It's when you get beyond the XI that the doubts start to arise. A lack of strength in depth is where Barca started to fall behind their rivals Real, with successive quarter-final defeats after winning the Champions League in 2015 at least partly down to fatigue. With little done to address that, it's hard to imagine Ernesto Valverde's side going much further. Which British team will get furthest? This is a historic season for English participants, with five teams in the group stage for the first time thanks to Manchester United's qualification via their Europa League triumph - and they are joined by Scottish champions Celtic after their admirable negotiation of the qualifiers. Jose Mourinho's side look like having a fairly comfortable return to Europe's top table in their group, even if Benfica are opponents who should not be underestimated. Chelsea face an Atletico Madrid side dealing with a player registration ban and a rebuilding Roma, while Manchester City must beware of Napoli's deadly attack and Shakhtar Donetsk, who had a record-breaking return to prominence under Paulo Fonseca last season. Tottenham face a tough task with Real Madrid and Borussia Dortmund on their way to Wembley, but Celtic have a fighting chance of a Europa League spot behind Bayern Munich and PSG, with rivals Anderlecht having started their title defence badly. Heading into the knockout stages, the picture is less clear. The field is strong, and one wonders if City have the defensive leadership to stand up to the very best forward lines in Europe. Antonio Conte has yet to prove he can sustain domestic dominance and a strong Champions League campaign, while Mourinho was tactically found out in his last outing in the Champions League knockout stages. Maybe Liverpool, with Mohamed Salah adding even more pace and incision to their attack, have the versatility to surprise a few. Jurgen Klopp's Dortmund always thrived by counter-attacking against teams who play on the front foot, and his current side are built in a similar fashion. Who will this year's surprise packages be? RB Leipzig face a tough baptism in the competition, having been drawn in a very balanced group featuring French champions Monaco, ambitious Besiktas and an improved Porto. Yet Ralph Hasenhuttl's side have done the hard part by hanging onto Naby Keita (for now) and Emil Forsberg in midfield, the conduits for their fast-breaking game. Timo Werner will score goals and newly signed winger Bruma is an explosive proposition. Leipzig already have the know-how to flourish. Napoli are a dark horse for the latter stages. While other teams in Serie A - notably AC Milan - have made waves in the transfer window, Maurizio Sarri's side have opted for stability, and have a sublime front three of Dries Mertens, Jose Callejon and Lorenzo Insigne. With myriad midfield options including the still-potent Marek Hamsik, who is fast approaching Diego Maradona's club goalscoring record, they are one to avoid. Facing Manchester's other representatives, Benfica are hardened competitors despite again selling some of their top talent, and have reached the knockout stages twice in a row under Rui Vitoria. In terms of individuals, it's worth keeping an eye on their neighbours Sporting's new midfield general Bruno Fernandes, who has started the season brilliantly with an eye on Portugal's World Cup squad. In Liverpool's group, Dutch winger Quincy Promes was probably the Russian Premier League's outstanding player last season for Spartak Moscow - and with Chelsea's opponents Roma still looking for a direct Salah replacement, young Turkish left-footed attacker Cengiz Under - who was excellent for Basaksehir last term - might get his Champions League chance.